Enjoy the history and beauty of Cape Ann's coast, up close! 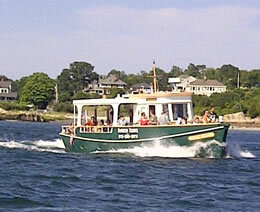 Presented by Cape Ann's longest-running sightseeing company -- since 1969! 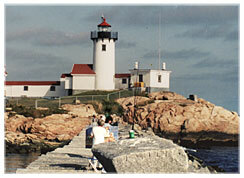 You and your family will love our Cape Ann Lighthouse Cruise. Many people consider it to be the highlight of their visit! See parts of the Cape you can't reach by car -- or on any other boat trip! Bring your camera -- you'll see historic lighthouses, Gloucester's fishing fleet, lobstermen, drawbridges, islands, and Cape Ann's spectacular natural beauty. Learn about some of the names of famous artists and poets that spent time here painting and writing. Hear about the great granite industry that flourished here for many years. Restrooms, snacks and drinks are available on board. Trip length is approximately 2-1/2 hours. Advance ticket purchase strongly suggested! NOW AVAILABLE: OFFICIAL U.S. LIGHTHOUSE SOCIETY PASSPORTS ON BOARD! We will stamp your passports with official lighthouses stamps to all lights viewed while underway. U.S. Lighthouse Society Members also get a $5 discount on the Lighthouse Cruise.